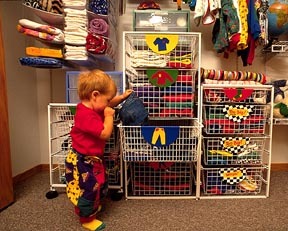 Determined to keep young Michael's floor open for play, his parents opted for closet storage instead of a dresser. To help find belongings, and learn tidiness, basket labels are pictures of contents. 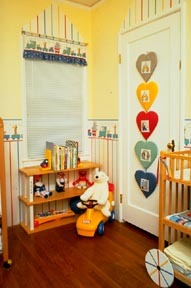 Baby's first setting should take more than cute and cuddly decor into consideration. A fostering environment should be stimulating and protective as well as responsive to developmental needs. What's in vogue may be fun, but it's not a prerequisite for pleasure. A sampling of engaging settings that are playful without playing on a theme are pictured below, in hopes of inspiring special places for other babies' first impressions. 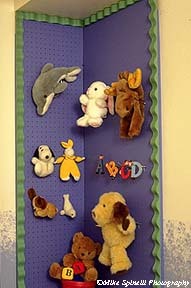 Playful hangings on a pegboard display change position continually to entertain Baby from a nearby crib. The curved trim on the display is made from the wood-closure strips on inexpensive corrugated roofing. The design is by Denise Tom-Sera. 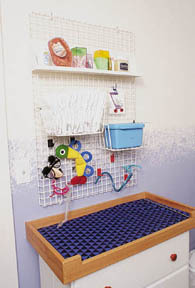 Featured in "In My World"
When there's no place to go but up, a wall grid serves as efficient storage for Baby basics. At this change station, there's room for diapers and supplies as well as a few amusing toys. "Everything in the room is a potential toy and teacher," says designer Denise Tom-Sera, who created this setting for son Nikko. 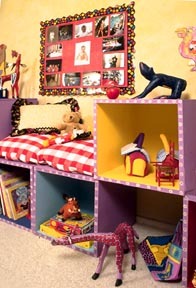 A child's imagination is so strong," says designer Bonnie Jaffey. "All it takes is a suggestion to trigger it. If decoration is very defined, a child's imagination has no place to go." Note the "wheel" attached to the changing table base when her son reached toddler stage. Besides sparking fantasy play, hints of decor enable a room's look to change easily. Crayon colors add life to these inexpensive unfinished cubes. Designer Lynnette Reid Weir, mother of four, utilized them to create storage, display space and seating in her daughters' shared quarters. Like your child's building blocks, modular furniture cubes can be arranged in many ways. Let child height and activities help determine what arrangement works best in your home. One way to herd soft toys is to gather them into a big flat open basket. The less structured the grouping, the less messy it appears when a child randomly removes one or puts them away.